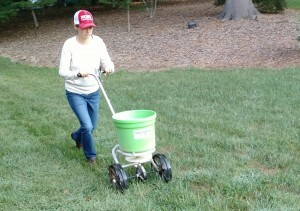 September is the time to fertilize cool season grasses like tall fescue. Tall fescue is the most common lawn grass in Caldwell County. With cooler temperatures, fertilizer, and rain, tall fescue will become greener in color. Although we can not control the temperature or rain, we can do our part and fertilize. Besides fertilizing now, I also recommend fertilizing again about Halloween. This second fertilizer application helps keep grass green throughout the winter. Staying green not only looks nice, it also helps the grass produce energy reserves. These plant reserves help the fescue maintain a nice green color throughout the winter. A soil test is the the best way to determine lime and fertilizer needs for your lawn. Soil testing kits are available at the Caldwell Extension Center. These soil samples are actually analyzed by the North Carolina Department of Agriculture – Agronomic Division. If you do not have a current soil test, look for a fertilizer with a ratio of 3-1-2 or 4-1-2 such as 12-4-8 or 16-4-8. Apply one pound of actual Nitrogen (N) per 1000 square feet in September and again about Halloween. To calculate how much fertilizer you should apply per 1000 square feet, divide 100 by the FIRST number of the fertilizer bag. (The first number always represents nitrogen content.) For example, if you’ve got a 10-10-10 fertilizer, divide 100 by 10 and you get 10. That means you need to buy 10 pounds of fertilizer for every 1,000 square feet of lawn. Likewise, if you were using 12-4-8, divide 100 by 12 to get 8.3 pounds. 8.3 pounds is the amount of fertilizer to apply per 1,000 square feet. When fertilizing, especially with high analysis fertilizers, I like to split my application. I will put half the fertilizer out in one direction. For a more even fertilizer application, put half the fertilizer out in one direction, and the other half of the fertilizer going in a direction perpendicular to the first half. Then I put the second half of the fertilizer going perpendicular to the direction I applied the first half. This makes for a more even application. I also like to sweep off any fertilizer that falls on driveways and walkways to prevent washing into storm drains, streams, and waterways. A leaf blower is also a good tool for this. Fertilizer manufacturers usually supply recommended spreader settings on the back of the fertilizer bag. This is an easy way to be sure you are applying the correct amount of fertilizer. If there are no suggested settings for your spreader, it will be necessary to do a calibration. There are techniques for calibrating spreaders that are appropriate for golf courses and other turf managers. This involves collecting the fertilizer on a plastic sheet or using pans to determine swath width, etc. For homeowners, I do not think it needs to be this complicated. To calibrate a rotary-type push spreader, use a test area of a known size. For example, a side yard could be a good test area. Measure the test area and calculate the amount of fertilizer needed. If applying 12-4-8, we would need 8.3 pounds per 1,000 square feet so we would be applying the recommended 1 pound of actual Nitrogen. If our test area is 2,000 square feet, then we would need 16.6 pounds of fertilizer for this area. Once the test area is measured and the amount of fertilizer is determined, next it is time to adjust the spreader. Adjust the opening on the spreader to 1.5 times the size of an individual fertilizer granule. Then added the determined amount of fertilizer in the spreader and make an application to the test area. If more than two or three passes is required to dispense the entire amount of fertilizer, make an adjustment to the spreader opening and try again on the next area in your lawn. When you have finished applying fertilizer to the entire lawn recheck to see if the approximate amount of fertilizer calculated was actually applied. Fall is also the time to renovate or over-seed tall fescue lawns. If you plan to put out any seed this fall, do not use a weed-and-feed type fertilizer. Weed-and-feed fertilizer is actually a fertilizer combined with a herbicide. The herbicide is typically a preemergent herbicide. A preemergent herbicide kills germinating weed seed. However, it will also kill germinating grass seed, too, so never use weed-and-feed fertilizer when sowing seed. Follow these basic fertilization strategies for a healthy fescue lawn. If you have other questions about your lawn, garden, or landscape, call the Caldwell County Extension Center at 828-757-1290 or visit us online anytime at //caldwell.ces.ncsu.edu.